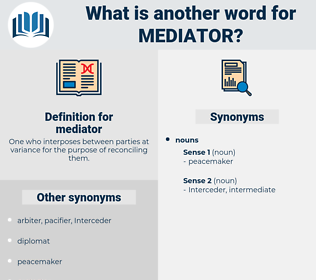 What is another word for mediator? One who interposes between parties at variance for the purpose of reconciling them. Parties, Interposer, envoy, adjudicator, brokering, referee. mediation, ombudsman, ombudsmen, Mediating, facilitator. 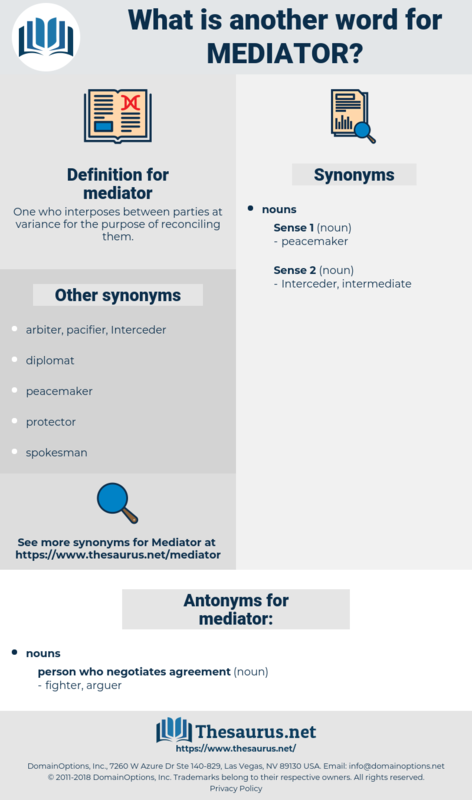 arbitrator, mediation, arbiter, ombudsman, ombudsmen, Mediating, facilitator. Therefore, there must be a Mediator between them, a peace - maker, to make of two one, to take up the difference. God out of a mediator will not hear thee. mandara, motor, manumitter, metatheria, mater, minter, mandatory, matter, mantra, monandry, monterey, metier, meeter, motor area, momentary, madder, monetary, motorway, meter, mentor, maunder, mindoro, metre, mudra, medawar, meteor, minatory, manta ray, meadow rue, maeandra, mid-water, mutter, monitory, monterrey, midair, m-theory, man-eater, miter, mounter, minder, mother, mitra, maitreya, mudder, mutterer, manometer, metro, mandator, mitre, mandatary, madeira, many another, Mata Hari, Mammee Tree, monitor, miniature, Mediatory, minotaur, matador, mature, mithra, menander, mender, meander.